For Rachel Kloos, her passion for environmental issues – especially water cleanliness and conservation – was instilled as a young kid growing up in southern California. “I always knew that caring for the environment was something important to me, something that would make a difference,” says Rachel. Which may have been inevitable: She was, after all, named for famed environmentalist Rachel Carson. 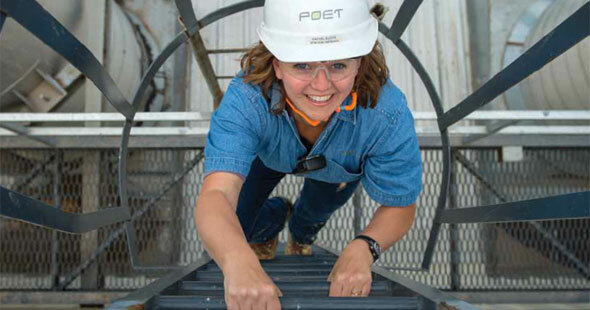 Rachel’s engineering proficiency matches her passion, according to Brian Wilt, the GM at POET Biorefining – Chancellor. And while he’s worked at POET for less than a year, Wilt learned all he needed to know about Rachel in his first few weeks on the job. Vital: Is water, or at least the environment, something you’ve always been interested in? rachel: Yes. My big obsession was the Salton Sea. I grew up in the desert in southern California, so the Salton Sea was the place we used to go to as kids. It was our beach retreat. It was a beautiful, huge lake. It’s one of the only saltwater lakes, so it has a really neat ecosystem and lots of really interesting marine life. I watched it go downhill with pollution over the years, and that stuck with me. Were you brought up to care for the environment? rachel: My mom [Linda] is a retired teacher. My dad [Glenn] is a retired city manager. Because of his job, one of the things he was always big on was parks and recreation and community development. Every city we lived in we always did a lot with recreational areas. Getting parks up and going, swimming pools, cleaning things up … This is all stuff I did through high school. What did you really want to be as a kid? rachel: To be perfectly honest, I wanted to be a ballet dancer. That’s what actually got me out of California. I started college at Creighton University. They have a really good fine arts program. So you went to pursue dance? rachel: Yes, to pursue dance. And then figured out that’s probably not going to pay any bills. Do you do any dancing now? rachel: Well, yeah. Uh, no. I guess you’re probably writing this stuff down. Well, this is an interview for a magazine, so I am writing this stuff down. rachel [laughing]: Then no, I don’t do any dancing now. rachel: When I first started college, I took lots of science, lots of biology, lots of math. I knew that was the direction I wanted to go if my dance career didn’t turn out. I took my first ever chemistry class my freshman year at Creighton, which was like “Chemistry for Dummies.” I just fell in love with it. I had this really eccentric professor. I thought ‘This is what I want to do.’ My last year I transferred to Augustana College [in Sioux Falls], and they were very big on what you were interested in career-wise. So they’d say ‘What are you interested in this week?’ And I’d say ‘explosives.’ Then they would tailor their curriculum to meet that. rachel: Sure. And the next week I’d come in and say ‘Now I’m interested in water reclamation.’ It was an incredible experience. rachel: I am, to Mike Kloos. rachel: We have two daughters. Sam is 10 and Jenny is 2.
rachel: Our big hobby is restoring cars. We’re totally into old European cars: Volkswagens, Porsches, that kind of stuff. Are you working on cars right now? rachel: We have a 1964 356c Porsche. That one’s almost ready for paint. We have a ‘71 Volkswagen Beetle that’s done. I drive that all the time. And then we have a 1970 MG Midget. That one hasn’t been started yet. What’s your forte when it comes to working on the cars? rachel: I’m supervisor. I love to help out. Mike’s the one that does most of it. My job has been chroming, polishing chrome, taking stuff apart, labeling, looking up parts. Mike can do the body work and the motor work? rachel: Yes. he’s a motor head. We like doing it. It’s a lot of fun. You started at POET in 2003? rachel: Yes. I applied for an engineer position and didn’t get it, but they had a quality manager position open and they offered me that job. I started as a quality manager. And what have your positions been since quality manager at POET? Have there been that many? rachel: Yes. I was quality manager for two years. The tech manager left after two years so I took over for him. After a couple years, I came down to Sioux Falls and worked in design construction, water treatment designs, that kind of stuff. Then went back to plant management as an operations engineering manager and was there for the last four years. And I just came down to Chancellor in December. What brought you to Chancellor? rachel: As an engineering manager, I was traveling quite a lot and I just wanted to be home a little bit more. The other part is, Chancellor is our most – and I say most because POET as a whole is environmentally forward – but Chancellor is like the cream of the crop as far as being environmentally forward. There are a lot of exciting projects going on down here. It was a great opportunity. Plus, it’s the biggest plant. It’s the best. Is there one thing you’ve worked on that you are most proud of on the environmental side? rachel: I was lucky enough to be involved in Total Water Recovery from the beginning. rachel: Total Water Recovery is internal recycling of nonprocessed related waters to reduce overall water usage from all our plants. This is the cool part about POET. You can come up with an idea, and then make it happen. We were looking at building a new plant in Minnesota. We were figuring out how we were going to manage the environmental limits, rules and regulations which had changed over the past few years. That was going to be a struggle. We sat down as a group one day and decided we could spend a lot of money cleaning up this water so we could discharge it based on Minnesota’s rules. But, then we figured, if we are going to do all this why don’t we recycle it internally and use it for ourselves? Why do we have to put it all down the drain? That’s how it all got started. When the plant in Bingham Lake, Minn., was going to a new water source, we realized the technology and ideas for TWR would fit well there. And we made that happen. Any thing else you want to say? rachel: I want you to put on the record how brief I was with my story telling. Tell them how quiet and reserved I was. I’m kidding, of course. I’ll do my best to make you sound quiet and reserved. rachel: Really, when I think about POET, I always think about all of the people here who have made such an incredible impact on me. It all has to do with the leadership, to be perfectly honest. We get to build these incredible relationships here. There is such a sense of community. We get to all work together as a team to accomplish one thing, and that thing can change the world. How could I have a better job than that?